Sunday’s gorgeous weather had me outside at last, flinging caution to the wind and raking a few spots in the lawn, cleaning out some of the beds I can reach from the sidewalk and looking for signs of life. 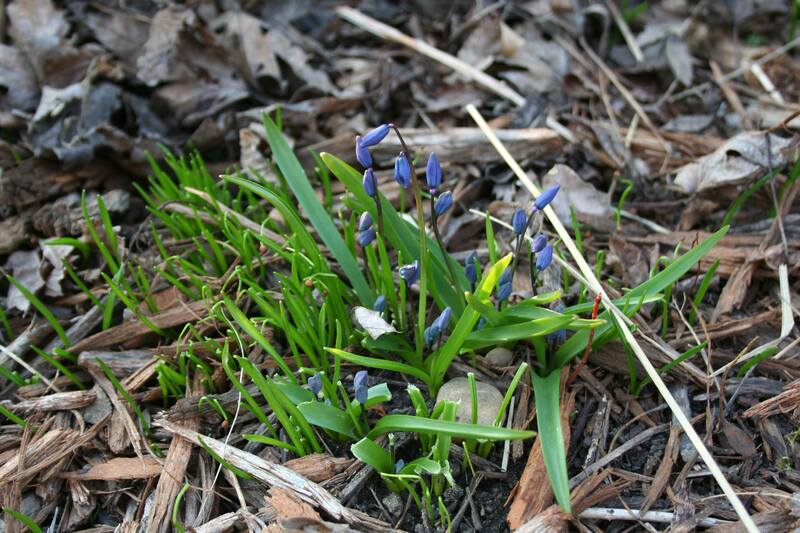 The Siberian squill, which have long been one of the plants I measure spring by, are just one day away from blooming and the miniature cabbage heads of sedum can be spotted under the leaf-mulch. I’ve been looking for them, but there’s no sign yet of the Iris reticulata that is usually the first plant blooming in my yard. Perhaps it is a victim of the long winter. It may still appear yet. Last year, it was April 22 when I first spotted them. They’ve bloomed as early as March 25 in the past. With the forecast calling for decent temperatures and occasional rain this week, we could see a burst of bloom by next weekend. Here’s hoping! « Can You Repel Rabbits with Plants?